Luis Conte (born 16 November 1954) is a Cuban percussionist who has backed acts such as James Taylor, Madonna, Pat Metheny Group, Eric Clapton, Carlos Santana, Phil Collins, Rod Stewart and Shakira. He immigrated to Los Angeles in 1967, where he attended Los Angeles City College studying music, and entrenched himself in the music community. Conte's started his professional career as a studio musician for Latin Jazz acts such Caldera. His live career took off when joined Madonna's touring band in the 1980's. To date Conte has had an extremely successful career with a run composing and playing in the Dancing with the Stars band, among many other tv and film projects. As a child in Cuba, Conte began his musical odyssey playing the guitar. However, he soon switched to percussion, and that has remained his mode since. He was sent to Los Angeles by his parents in 1967, in order to prevent him from being forced to serve in the Cuban military. This was a turning point in Conte's life, as the musical community in Los Angeles during this period was vibrant. It was during this time that he studied at Los Angeles City College. Luis Conte (rear), plays with James Taylor's "Band of Legends." Conte proved himself versatile musically, and by 1973, he was playing regularly in local clubs. He quickly became a busy studio musician, and throughout the 1970s, he played in the Latin Jazz band Caldera. 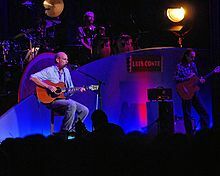 Luis Conte was part of Phil Collins 1997 "Dance into the Light" tour and 2004 "First Farewell Tour", performing in both of them Afro-Cuban percussion and adding more depth into the concert songs. He also performed during The Phil Collins Big Band tours in 1996 and 1998 and again during the Phil Collins Not Dead Yet tours 2017/2018. In 2009 worked together with Sergio Vallín in his Bendito Entre Las Mujeres album. ^ Tarradel, Mario (June 13, 2003). "The world according to Ziggy". Dallas Morning News. Retrieved 21 September 2011. ^ "Louis Conte | Credits | AllMusic". AllMusic. Retrieved 2018-10-20. ^ "Luis Conte". IMDb. Retrieved 2018-10-20. Yanow, Scott (2000). Afro-Cuban Jazz. San Francisco: Miller Freeman Books. ISBN 0-87930-619-X.